To prevent influx of pests that could create agricultural problems, produce-importing nations enforce strict rules—depending on the commodity and the infesting insect. The rules often require vulnerable produce to be treated in some way that ensures destruction of pests. For several decades, methyl bromide has been a mainstay treatment to kill a wide array of quarantined pests as well as those encountered in orchards, packinghouses, and food plants. But this potent chemical fumigant is being phased out because of evidence linking it to damage to Earth's ozone layer. Although the effectiveness of using radio waves to kill destructive insects in agricultural products has been known for 70 years, the technique has never been applied on a commercial scale. A recent cooperative effort by four ARS research laboratories and two universities aims to overcome the technical barriers for the use of radio wave heating to control pests on a commercial scale. waves to kill fruit flies. Electromagnetic waves of radio frequency can make molecules vibrate and heat up—like microwaves heat food. The trick is to kill pest insects without killing the taste or texture of the food they infest. Since 2000, a team led by Juming "Jimmy" Tang of Washington State University (WSU) in Pullman, involving four ARS laboratories and the University of California-Davis (UC-Davis), has been working on a 4-year study to see whether radio waves would be an economical, environmentally friendly alternative to methyl bromide and other chemicals to effectively rid fruits and nuts of live, quarantined insects. In Weslaco, Texas, ARS entomologist Guy J. Hallman is checking out use of radio frequency treatment of citrus against the Mexican fruit fly. He's in the Crop Quality and Fruit Insect Research Unit at the Kika de la Garza Subtropical Agricultural Research Center. Hallman is developing a device to simulate what's needed to heat-treat citrus fruit with radio waves commercially. "We're trying to bridge the gap between the laboratory and real world," says Hallman. "Once we know how to treat fruit in a commercial situation and how much it will cost, any producer, shipper, or packinghouse operator can use the information to decide whether radio wave pest control is a viable option." In Hallman's system, citrus fruit would pass through a conveyor between a series of radio frequency heaters. To simulate a commercial system in the laboratory, the fruit are conveyed in a circulating water bath to keep them moving during heating. This would prevent the fruit's overheating from extended contact with any one area of the bath. And to ensure continuous heating from the peel in to the fruit's center—essential to killing all fruit flies that might be present—a bumper would dunk any fruit that bobbed above the water surface. This prevents dark-black rings from forming around the fruit at the water's surface because of an energy concentration where the water meets the air. 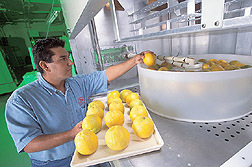 A method using just hot air to treat fruit in boxes or bins has been tried commercially in Mexico with mixed results. It takes hours to complete and puts a strain on the fruit's skin, sometimes causing heat damage. Radio frequency heating can be done in less than half an hour and is less damaging, since the fruit is heated uniformly throughout. Hallman has focused on grapefruits but is also working with other citrus, including oranges and tangerines. The larger the fruit, he notes, the harder it is to heat uniformly and the more likely to form hot and cold spots. "This multi-lab project is making a serious effort to take a look at things that haven't been looked at with radio frequency heating," says Hallman. "I think we stand a good chance of finding out how radio frequency disinfestation can be done to a large volume of fruits or nuts—and if it can be done on a commercial scale." He predicts that by this summer he'll have a good idea of what the treatment will cost. If you're in Wapato, Washington, don't be enticed by the apples floating in the tub in James Hansen's laboratory. You don't want to go bobbing for them. There are several reasons, says Hansen, an entomologist with ARS' Yakima Agricultural Research Laboratory. The first is that this particular tub is filled with salt water. Second, if you were to latch onto one of the apples with your teeth, you might bite the proverbial worm—a larva hatched from a codling moth egg. And Hansen wants these apples intact—no tooth marks, please. Such a mark might skew the results of tests he is conducting on use of radio waves to rid the fruit of live, pesky insects like the codling moth before market—or shipment to trading partners like South Korea and Japan, where such pests might not already occur. Japan is particularly stringent about what phytosanitary methods it will accept for disinfesting fresh produce. This rule also applies to sweet cherries, a tree fruit commodity that generates over $145 million in yearly national export sales, notes Hansen. In cooperation with the team led by Tang, a professor in biological systems engineering at WSU, Hansen plans to "bathe" tubs full of apples and cherries with radio waves to determine exposure times that will kill codling moth larvae without affecting fruit quality. From two lines of research—one focusing on the insects, the other on fruit quality—and three major disciplines—engineering, entomology, and plant physiology—the collaborators hope to position radio wave treatment as a technology that can be readily adopted by commercial packinghouses or quarantine operations in lieu of methyl bromide. "Without suitable alternatives to methyl bromide, we're going to be up a creek," ARS horticulturist Stephen R. Drake says of the U.S. fruit industry's fight against quarantined pests. 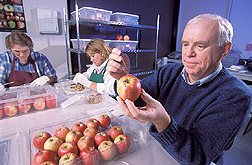 He is with ARS' Tree Fruit Research Laboratory in Wenatchee, Washington. "Ideally, you want to treat the fruit with radio frequency while it's being packed and designated for a particular market," Hansen explains. "Commercial packers can't afford to have produce sitting there, so we want this treatment to kill the insects as soon as it can." Tang, Hansen, Drake, and Lisa Nevens, an ARS entomologist at Yakima, first began working on the radio frequency project in 1996. Meanwhile, in California, entomologist Judy A. Johnson is also keenly attuned to the potential of radio frequency energy to zap destructive insects. Her primary targets? The wiggly larvae of the navel orangeworm, Indianmeal moth, and codling moth. These insects are among the worst enemies of walnuts, almonds, and pistachios and of dried fruits such as figs and raisins. Johnson has newly added red flour beetle to her list of culprits—a lesser pest of the nut and fruit crops but a major problem in flour mills and food-processing plants. Johnson is doing the radio frequency work at the ARS San Joaquin Valley Agricultural Sciences Center at Parlier, near Fresno, in close association with cooperators at WSU and UC-Davis. They have already developed a preliminary picture of the target insects' ability to endure heat—their "thermal tolerance." The laboratory experiments that Johnson and her ARS and university colleagues conducted are the first to extensively detail the thermal tolerance of the navel orangeworm, Indianmeal moth, and codling moth. For one test, Johnson and co-investigators drilled tiny holes in over 500 in-the-shell walnuts; enticed the slender, whitish navel orangeworms to enter the shells; then plugged the holes to block the insects' escape. The scientists then tried some novel combinations of radio waves and hot forced air, that is, air that's heated and blown into the test chamber holding the nuts. Radio waves, alone or combined with hot forced air, were used to heat the nuts to 55° C (131° F) in about 5 minutes. Hot forced air was then used to keep the nuts at 55° C for 5 or 10 minutes. "All the treatments killed 100 percent of the navel orangeworms," reports Johnson. What's more, tests led by co-researchers Tang at Pullman and Elizabeth J. Mitcham at UC-Davis, showed that the treatments didn't harm the quality of the nuts—even in long-term storage. "That's critical," Johnson points out, "because walnuts are often stored for a year or more before they show up at your supermarket." In addition, walnuts are rich in oil, so they're more vulnerable to heat damage than some other kinds of nuts, such as almonds. "That's why we think that if a treatment is okay for walnuts," Johnson continues, "it will likely be okay for almonds." Indianmeal moths proved to be more susceptible to heat than navel orangeworms are. "Indianmeal moths are silvery, and wedge-shaped. If you open a kitchen cupboard where you keep raisins or breakfast cereals and a little moth flies out at you," Johnson explains, "chances are it's an Indianmeal moth." For this experiment, Johnson and her colleagues used metal heating blocks, or plates, specially designed by Tang for the radio frequency research. They placed target insects in the small gap between the plates, which were then heated to specific temperatures and held at those temperatures for precise periods. She and her associates assembled some 15,000 Indianmeal moth larvae for the study, exposing them to temperatures ranging from 44° C to 52° C (about 111° F to 126° F) for 2 to 100 minutes. "In general," Johnson comments, "the lower the temperature, the longer it took to kill the larvae. These readings are the basis for a new, math-based model for projecting the rate of kill at other time-and-temperature regimens. Because of the large number of larvae tested and the range of temperatures that we investigated, we're very confident of the accuracy of the model's projections." Johnson and her cooperators also used the special heat plates to discover more about the amount of time and heat that it takes to kill navel orangeworms. They exposed 15,000 navel orangeworms to temperatures ranging from 46° C to 54° C (about 115° F to 129° F) for 1 to 120 minutes. Using the new data, they created a mathematical model of the navel orangeworm's thermal tolerances. The findings from the Texas, Washington, and California experiments are an essential starting point for making the radio frequency energy approach a success, Johnson says. The scientists have published their findings in the Journal of Economic Entomology, Journal of Stored Products Research, and Postharvest Biology and Technology.—By Alfredo Flores, Jan Suszkiw, and Marcia Wood, Agricultural Research Service Information Staff. This research is part of Methyl Bromide Alternatives, an ARS National Program (#308) described on the World Wide Web at http://www.ars.usda.gov/research/programs.htm. Guy J. Hallman is in the USDA-ARS Crop Quality and Fruit Insect Research Unit, Kika de la Garza Subtropical Agricultural Research Center, 2413 E. Hwy. 83, Bldg. 200, Weslaco, TX 78596; phone (956) 447-6313, fax (956) 447-6345. Stephen R. Drake is with the USDA-ARS Tree Fruit Research Laboratory, 1104 N. Western Ave., Wenatchee, WA 98801; phone (509) 664-2280, fax (509) 664-2287. James D. Hansen is in the USDA-ARS Fruit and Vegetable Insect Research Unit, 5230 Konnowac Pass Rd., Wapato, WA 98951; phone (509) 454-6573, fax (509) 454-5646. Judy A. Johnson is with the USDA-ARS Commodity Protection and Quarantine Insect Research Laboratory, San Joaquin Valley Agricultural Sciences Center, 9611 S. Riverbend Ave., Parlier, CA 93468; phone (559) 596-2768, fax (559) 596-2721. "Radio Frequency Puts the Heat on Plant Pests" was published in the February 2003 issue of Agricultural Research magazine.